Indian names: bada kainth, shiara, zarenth (Himachal Pradesh). 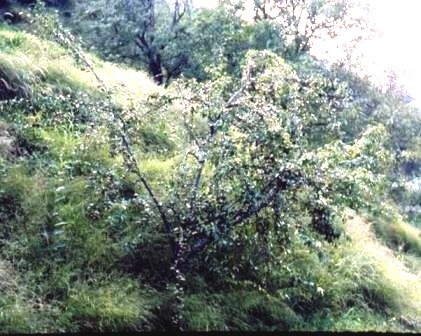 Shiara trees are found throughout the mid-hill region. They are, however, not so numerous as those of Pyrus pashia Buch. & Ham. The fruits of this species are larger and less gritty. A tall thorny and deciduous tree, 8 to 10 metre in height; bark, rough, dark brown to black; the girth of the trunk is 80.1 cm; thorns arise from leaf axils, 4.7 cm long, less numerous than those of Pyrus pashia Buch. & Ham; internodes, 3.5 cm. Leaves, stipulate, alternate, serrate, acuminate, ovate, petiolate (petiole about 10 mm long), with reticulate venation; leaves still delicate and pubescent at flowering in spite of their having attained full size; the leaves are borne laterally on, one-year-old shoots. On the older wood, they are borne on, thorns and non-fruiting spurs. Flowers, pedicellate, ebracteate, actinomorphic, cyclic, complete, pentamerous, hermaphrodite, epigynous, white, 2.7 cm in diameter; calyx, gamosepalous, with 5 sepals, regular, superior, sepaloid; corolla, polypetalous, with 5 petals, regular, orbicular, superior, white, having imbricate aestivation; petals, 1.6 cm long; androecium, with numerous stamens (20 to 30), free, superior, bithecus, dorsifixed, 9 mm long; gynoecium, 5-carpelled, syncarpous, inferior and 1 cm long. 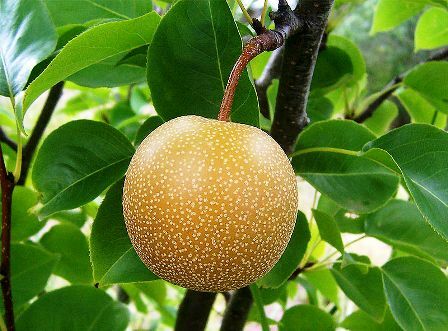 Fruit, a pome, stalked (stalk, 3.5 cm long), yellowish brown, with rusty white spots on the outer surface; diameter, 5 cm; weight, 67.3 g; volume, 61.5 ml; pulp, yellowish white; fruits borne on spurs. Seeds, dark brown, pyriform, 9 mm long, 4 mm in diameter; weight, 49 mg, volume, 80 microlitres; 7 seeds per fruit; some seeds shriveled. 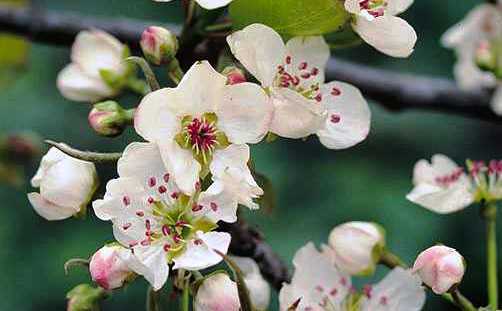 Flowering takes place in March and the ripening of fruits starts from November and continues up to the end of December. The fruits attain a fairly large size in the end of September and can be eaten even at that stage. The average yield of this fruit is 83 kg per tree. The yield of tree can, however, go up to 200 kg. Moisture, 72.5; total soluble solids 19; acidity, 1.4; total sugars, 4.88 (mostly as reducing sugars); tannins, 0.32; pectin, 0.9; protein, 3.16; phosphorus, 0.014; potassium, 0.271; calcium, 0.027; magnesium 0.017; iron, 0.015; ash, 0.884. The vitamin C is 0.61 mg per 100 g.
Although the fruits are somewhat astringent and gritty, yet they are eaten by all. The fruit quality is fair. The fruits are eaten and they are better in quality than those of the small-fruited wild pear. The fruits are juicy. They should make a good preserve and jam. Efforts should be made in this direction. 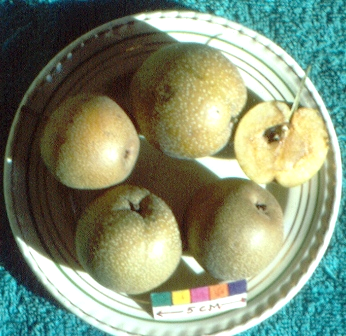 Shiara is also used as a rootstock for pears.